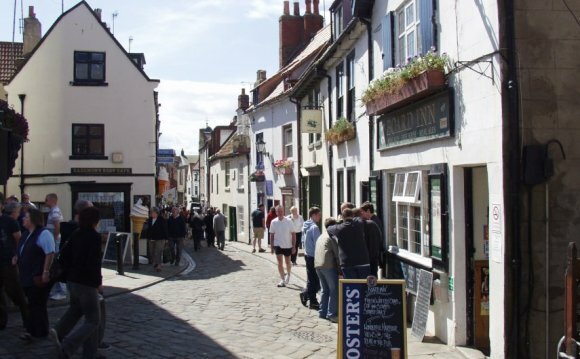 The town of Whitby on the North Yorkshire coast lays claim to fame for a number of diverse reasons. It was in Whitby that Captain James Cook, the well known explorer, began his seafaring career; it was here that the writer Bram Stoker first had the idea for his legendary novel, Dracula; and Whitby was and is one of the UK’s principal fishing ports. The historical features of Whitby include St Hilda’s Abbey, on the East Cliff, overlooking the town. The abbey was first founded in the seventh century and laid to waste several times by successive regimes, before finally being abandoned altogether and left to fall to ruin. It is also in this part of the town that there are one hundred and ninety-nine steps cut in to the cliff-face. These steps climb to an old churchyard and actually provided Bram Stoker with the main inspiration for the story of Dracula. It was its status as an important sea port that gave Whitby much of its acclaim. One of the attractions which can be seen in Whitby today is a scaled replica of Captain Cook’s ship, Endeavour. It is often possible to enjoy a sail in the ship at different times of the year, when the weather is clement. Boat lovers may otherwise enjoy simply strolling around the extensive harbour area, admiring the many different types of craft at their berths, or even availing themselves of a pleasure cruise or chartered fishing trip. On variable days of the week, depending upon the arrival of the fishing fleet, a fish market is held at Whitby harbour, where the catch is auctioned to merchants.